Here is some helpful information to find the best computer under $500. The average price of a personal computer is somewhere in the neighborhood of $1300, according to CNET.com. That’s a rather hefty chunk of change, especially if you’re a recent high school or college graduate and don’t have a sizable bank account (who does in this economy?). Even spending $1000 or $800 on a personal computer could be out of the picture. Fortunately, you can still find very good personal computers at a much more reasonable price. In fact, you can get a top-notch PC with great technology for under $500. An example of personal computer that some consider the best computer under $500 is the Compaq CQ4010F (pictured above). The retail price is only $350 — it comes equipped with an AMD Sempron LE-1300 Processor (2.3 GHz, 512 KB L2 Cache, 1600 MHz System Bus) 2 GB PC2-6400 DDR2 SDRAM memory, and Genuine Windows 7 Home Premium. In non-technical terms – it comes with a lot of really cool features that you’ll be able to use every day. The one drawback is that you’ll need to purchase a monitor, but you can find a good one for roughly $100 to $150. For example, you can get a Compaq Q1859 Monitor at Amazon for $120. In fact, Amazon has a deal where you can purchase the Compaq CQ4010F personal computer, the Compaq Q1859 monitor, and a Logitech S120 2.0 multimedia speakers for $480. This package is definitely a contender for the “best computer under $500” award. Of course, you should try to tailor your personal computer to your interests and desires. For example, if you’re really into gaming, you should try to find a computer package that features a broad range of gaming capabilities like a network card for interactive online gaming and software already installed. Amazon offers a Microsoft Sidewinder X6 keyboard that is ideal for gamers. It costs a little over $60, but if you find a reasonably priced personal computer, you could splurge on this keyboard. Other people search for personal computers that feature a DVD burner, or at least a DVD player so they can watch movies practically anywhere. Fortunately, many personal computers are starting to come equipped with a DVD player. There may not be a DVD burner already installed, but you can find a bargain DVD burner at Amazon like the Velocity Micro VMdrive External DVD player. A great computer to pair with Sidewinder keyboard would be the Lenovo IdeaCentre C100 (pictured above). It has a sleek design, 1.6GHz Intel N270 Atom Processor, 1GB 200 Pin PC2-5300 SO Dimm RAM, 160GB SATA 5400RPM Hard Drive, DVDRW Drive, Intel GMA 950 Graphics, and Windows XP Home so you’ll have all of the aforementioned Microsoft Office applications. All of this is selling for $399 at Amazon. If you decide to purchase speakers, you’ll probably wind up spending a grand total of $420. Throw in the Sidewinder keyboard and your grand total is $480. Not bad. 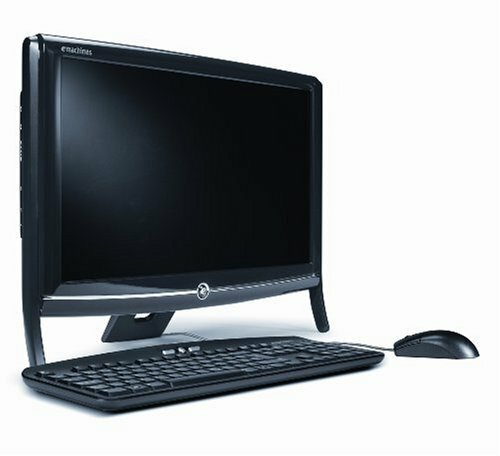 Another best value computer under $500 is the eMachines EZ1601-01 All-in-One Desktop (pictured above). As the name implies, it comes with all of the essential components for a personal computer – monitor, processor, keyboard, and mouse. Best of all, the price is a very reasonable $406 at Amazon. This is a very attractive PC for environmentally conscious individuals since it is equipped with an Intel energy-efficient processor performance, an 18.5-Inch widescreen LCD Display, integrated speakers, mouse and keyboard. It also comes with five USB ports and a Media Card Reader to transfer your photos and other files. There’s also the Gateway DX4822-01 Desktop (pictured above). Amazon has refurbished models selling for $480. It’s an impressive package featuring 2.6GHz Intel Pentium Dual-Core E5300 Processor, 6144MB DDR2 Memorys, and Windows 7 Home Premium. So let’s say, hypothetically, you’ve narrowed down your choices to three or four personal computers within your $500 price limit. Here comes the crucial question – which computer should you purchase? This question can only be answered by you, the purchaser, but we’d recommend going with a computer whose company has a good reputation, can provide a rock solid warranty, and received positive feedback from other computer consumers. The Compaq, Lenovo, Gateway, and eMachines have good brand recognition and reputation. The personal computers described above have received “5 star ratings” from Amazon consumers, which means the feedback is generally very positive. But if you want reassurance, do some additional research. A good resource would be PCWorld where they rate and review bargain priced personal computers. Check to see if your computer has been reviewed. The final step before making a purchase is to see what types of warranty options are available. This is important, especially if you’ve narrowed your choices down to some personal computer models that might be a few years older than most or may be a refurbished model. Keep in mind, a good warranty should not cost you an arm and a leg. It should be able to fit within your $500 budget. Your warranty should last for at least a year to eighteen months and should cover all major components. If it’s anything less, you may want to hold off on a warranty purchase and do some additional research to find a better deal. But if you like what you see from reviews and feedback on your computer choice, and the warranty is solid, you may have just discovered the best, top-rated computer under $500 that suits your needs. However, don’t feel compelled to drop $500 all at once. Amazon offers a no-interest payment plan where you pay off the principle within year (but remember, you have to pay it off in a year; extensions aren’t usually granted). That way, you’ll have your computer and a little extra money left over in the bank account. I’m confused. I didn’t think I’d ever see a desktop computer mentioned at all in this day and age on a site dedicated to efficiency. I understand large desktop systems still exist, but they are anything but efficient. There are choices for consumers in the sub $500 that would be much more efficient including laptops, netbooks and tablets. I understand a lot of folks use Microsoft, but there are free Linux variants (Ubuntu, SUSE, etc…) and office suites (openoffice, google docs, sliderocket) that are superior for a number of reasons (price, ease of use, feature set, compatibility, lack of viruses, etc…). Cheap laptops and netbooks can be found literally everywhere there is a walmart or any broswer that you can type tigerdirectdotcom into the address bar of. Laptops, netbooks and tablets consume *far* less electricity than any desktop system (include monitor, speakers, etc…), offer the computing experience most people require – and will certainly perform any computing task a sub $500 desktop will. You’re not stuck in one place with a laptop, netbook or tablet. Most people use computers to check email, facebook, twitter and instagram, netflix and iTunes, and there’s not much more you could do on an entry-level desktop. You can even cheaply and easily upgrade the RAM and hard drive in most laptops. Factor in the cost of electricity over a three year period and the TCO of the desktop machine will prove to be not only costly, but also an immoble, noisy, inefficient eyesore.